The 1868 New York state election was held on November 3, 1868, to elect the Governor, the Lieutenant Governor, a Canal Commissioner, an Inspector of State Prisons and the Clerk of the Court of Appeals, as well as all members of the New York State Assembly. The Republican state convention met on July 8 at Syracuse, New York. Henry Smith was Temporary Chairman until the choice of John Cochrane as president. John A. Griswold was nominated for governor on the first ballot (vote: Griswold 247, Horace Greeley 95, Stewart L. Woodford 36). Alonzo B. Cornell was nominated for lieutenant governor on the first ballot (vote: Cornell 219, Augustus Frank 88, Franz Sigel 6). Alexander Barkley for Canal Commissioner, the incumbent Prison Inspector Henry A. Barnum, and Campbell H. Young for Clerk of the Court of Appeals, were nominated by acclamation. The Democratic state convention met on September 2 and 3 at Tweddle Hall in Albany, New York. H. O. Cheesbro was temporary chairman until the choice of Robert Earl as president. Mayor of New York John T. Hoffman, the Democratic candidate of 1866, was nominated again for governor by acclamation. Allen C. Beach was nominated for lieutenant governor after an informal ballot (vote: Beach 68, Albert P. Lanning 47, William J. Averill 9, S. T. Ahnot 1). A German Democratic state convention met on September 2 at Schreiber's Hotel in Albany, New York with Henry Clausenger as president, and endorsed the nomination of John T. Hoffman for governor. 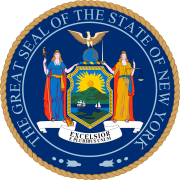 75 Republicans and 53 Democrats were elected for the session of 1869 to the New York State Assembly.